In 2008, Amy Dykstra began an experiment to quantify the extent to which Echinacea populations are locally adapted. Local adaptation occurs when individuals from a local population exhibit greater fitness when growing in their local environment than when growing in another environment and when individual from a population in that other environment exhibit greater fitness when growing in their own environment. To quantify local adaptation, one needs a reciprocal transplant experiment. Amy hypothesized higher seedling establishment and fitness for local versus foreign achenes reciprocally transplanted among widely separated locations. 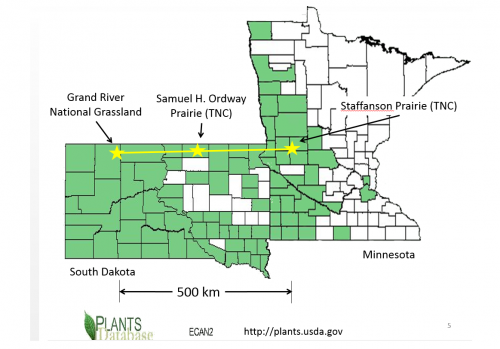 To test this, she selected three remnant Echinacea populations—one in Western South Dakota, in Central South Dakota, and near our study site in Western Minnesota—at approximately the same latitude. The three sites differ in climate, with maximum summer temperature increasing and annual precipitation decreasing to the west. Amy collected one head from each of fifty randomly selected individuals at each collection site in August 2008. In November, she sowed achenes from each source into two blocks at each site. She planted an average of 24 achenes at 150 positions in each block, for a total of 21,678 total achenes. In 2009, she assessed seedling survival. Since then, Amy (with help from Team Echinacea) has assessed fitness of individuals at each site annually, measuring flowering status, number of rosettes, number of leaves, and length of longest leaf of all surviving individuals, along with making notes of herbivory (damage to leaves). Study sites: Grand River National Grassland (Western South Dakota), Samuel H. Ordway Prairie (Central South Dakota), Staffanson Prairie Preserve (West Central Minnesota), and Hegg Lake WMA (West Central Minnesota). Link to flog posts: Read updates and annual reports about this common garden experiment on our flog (field blog) as written by Amy and other members of Team Echinacea.